On February 24, the Supreme Court will hear oral argument in Hughes v. Talen Energy Marketing. In deciding this case, the Court must determine whether an effort by the State of Maryland to incentivize the construction of new power plants is field preempted by the Federal Power Act (“FPA”)—that is, whether the Maryland law intrudes on an area that is exclusively the federal government’s to regulate. In this new Comment, published in the NYU Law Review Online, Guarini Center fellow Matthew Christiansen urges the Court to evaluate Maryland’s regulation under a conflict-preemption, as opposed to a field-preemption, standard. 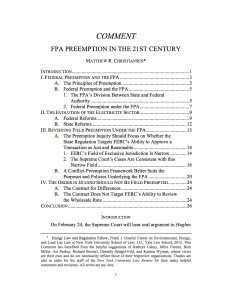 Christiansen argues that the Court should clarify that field preemption—a doctrine that prohibits any state regulation in a particular area of the law—applies only when a State targets the core aspects of federal jurisdiction under the FPA, namely the Federal Energy Regulatory Commission’s (“FERC”) ability to determine whether a wholesale rate is just and reasonable.